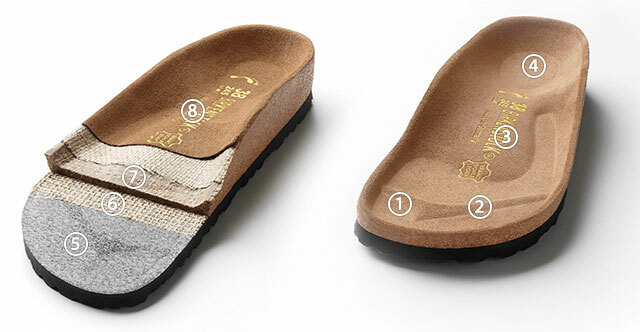 The heart of every Birkenstock model is the original Birkenstock footbed that started it all. The word "footbed" was first used by Birkenstock in the 1930s for anatomically shaped insoles with incredible arch support. Unlike other orthopaedic correctives at the time which were designed to treat deformed feet, the original Birkenstock footbed was produced to promote the maintenance of healthy feet. This construction has been thought out to the smallest detail. Our footbed has anatomical mouldings which support and relieve pressure on your feet, joint and back - allowing you to feel as comfortable as possible. Supports and relieves pressure on feet.